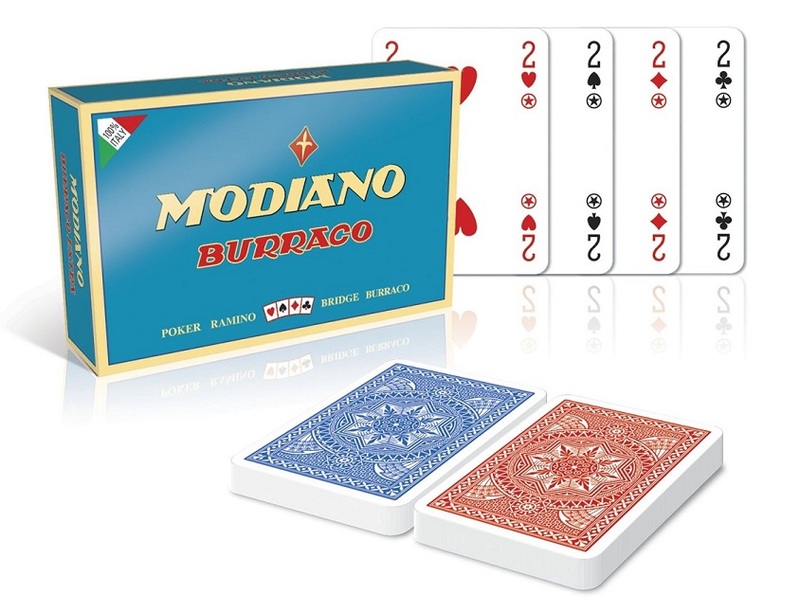 Burraco (2 - 4 players) is a set and sequence collection card game played with 2 decks of 54 cards, which has its roots in South America, where it is also known as Burako or Buraco. It is very popular in Italy where it is also played at tournaments and championships, and it has almost reached a cult status, for instance more than 2 millions players are involved in Burraco since his introduction during the early 80s. It is a faster version of Canasta because players can pick up spare cards in case they run out of cards (The source - Pozzetto), which results in various versions of melds, flush, run sequences cards and repeated suits being made. All deuces are wild; a Wildcard is a deuce used to substitute any card in a Run. Your aim is to reach the previously agreed point score by laying cards in combinations especially Burraco. The game is named after its famous meld of 7 cards which players need to achieve in order to win the game. the ART DECO back cover of the cards is inspired by the natural "ice" crystal patterns. in premium quality playing cards production.